Credit Card Fraud Protection Insurance: Should You Buy it? You discover your wallet is missing and then you remember you left it at a restaurant yesterday. Your mind races with thoughts of thieves running up thousands of dollars on your credit cards. You race to the restaurant to see if, by any chance, the wallet is still there. Yes! 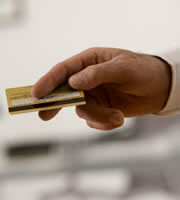 A waitress retrieves it, and all of your credit cards are safely tucked away--even your cash is safe. Weeks later, the incident comes back to mind when a salesperson calls offering you credit loss protection insurance. The policy is pricey--300 bucks a year--but it will give you peace of mind. That's worth something, right? Not in this case. These policies are a scam, and you should say no. Companies marketing credit card loss protection insurance use scare tactics making you think you would be on the hook for all those fraudulent charges. The so-called insurance policies cost hundreds of dollars, yet federal law limits your fraud liability on credit cards to $50 per card before you report the credit card missing. And many cards have zero liability policies, so you owe nothing if your card is stolen. The Federal Trade Commission calls these insurance policies "the real steal" and estimates that more than 3 million consumers have purchased them. Another feature you may be offered is a notification service for all your card issuers if your cards are missing or stolen. Consumer Action, the non-profit consumer advocacy group based in San Francisco, advises you to save money by doing it yourself. Write down your credit card account numbers and the toll-free numbers of all your credit card companies, and keep that information in a safe place at home, separate from your credit cards. That way, you have quick and easy access to all your accounts if you lose your wallet or it gets stolen. Take the list with you when you travel. To protect yourself against fraud, report missing or stolen credit cards immediately, and call your credit card issuer if you find unauthorized credit card use on your statement. Don't give out personal information, including your credit card or bank account numbers, to telemarketers. 0 Responses to "Credit Card Fraud Protection Insurance: Should You Buy it?"